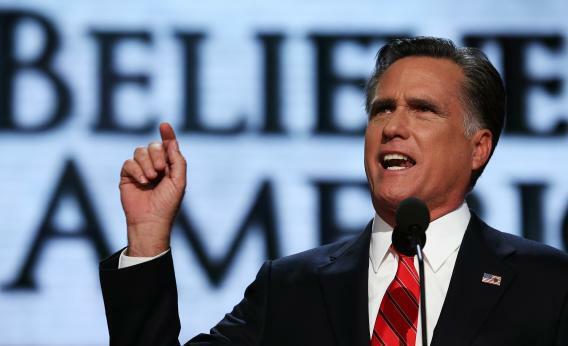 Romney and the GOP convention: He’s a decent man, but Republican policies are dreadful. Mitt Romney delivers his nomination acceptance speech during the final day of the Republican National Convention on Thursday in Tampa, Fla.
Every trial lawyer knows what it is like to sit patiently while the other side puts on its case. Inevitably they make a few points that appeal to the jury, and waiting for the opportunity to respond can be painful. The desire to jump up immediately—to point out the flaws in logic or the factual distortions—is often overpowering. So it has been watching the Republican convention. Let’s acknowledge the convention’s compelling moments. Ann Romney was a fine and sensitive voice, speaking from the heart about the hard work done by spouses and the tough times that every family goes through. Paul Ryan was evocative on the loss of faith we have suffered, the reality that sunk in after the euphoria of Obama’s 2008 victory. The testimonials about Mitt Romney were passionate. Let’s concede that Mitt Romney has a good heart and has worked hard, consistently with his faith, to help folks in need. And Romney himself seemed almost approachable in his speech, truly desirous of a better life for those who are not at his income level. But none of that matters to the bottom-line issue: Who can lead us out of the economic quagmire to a better future? We still have a serious jobs crisis, an equity crisis, and a growth crisis. The broad array of policies fought for and implemented by President Obama is moving us in the right direction, while the Republican Party has been nothing but an impediment to change and clear thinking. Moreover, the answers provided by the Republicans are either false or based on policies that have been tried and failed miserably. Their convention was filled with the platitudes of a Hallmark birthday card. There was not a single moment of learning, retrospection, or reflection about why we had an economic cataclysm. Not a single moment to ponder what actually works—and what doesn’t. The distortions and outright lies—all now well documented—were all they had left. At their convention next week, the Democrats should do more than try to attack Mitt Romney as a person. He is a fine man who does generous work and cares about other people. But he is dead wrong about the policies that will create a vibrant future for the vast majority of Americans. We must make clear that we have learned—even if Republicans have not—from the enormous errors in judgment and policy made by the last Republican administrations. We are better off now than we were four years ago, and that is because of the hard choices made by the Obama administration. Democrats should make that case, not just to lay the foundation for a victory in November, but to build public support for the actual hard work that must follow.